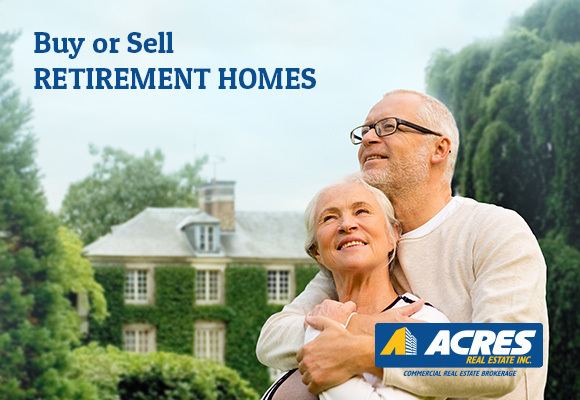 Retirement Homes Investment Services – Acres Real Estate Inc. Acres Real Estate Brokerage represents owners and investors in the confidential sale of retirement homes, nursing homes, assisted living facilities, independent living facilities, continuing care retirement communities, and medical office properties. By focusing on the key property types within a well-defined asset class, our team of investment sales professionals offers the industry’s finest brokerage services.Who understand our business and the requirements of confidentiality that gives our clients peace of mind. At Acres, we take a collaborative approach to seller and buyer representation. Our team works closely with each client to understand your investment objectives, and tailor our services to meet those precise requirements. We manage all aspects of the transaction process from the initial marketing effort to the day of closing, pursuing every opportunity in between to deliver optimal results for our clients. Specialized team of investment sales professionals,results-oriented, client-first representation.